If it doesn’t move… Stamp it! If it doesn’t move – stamp it! That is the slogan for a brilliantly creative home based business based in Creston that sells products all over the world. 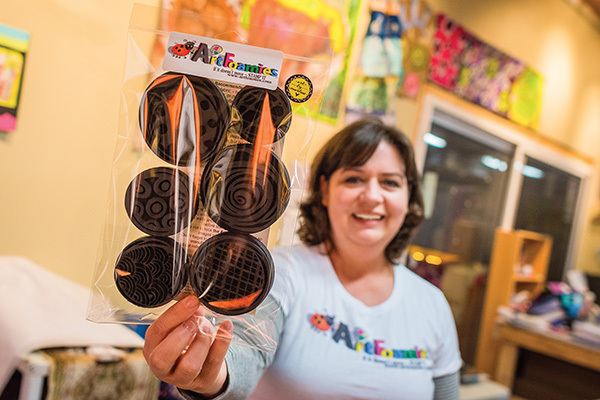 Emmie Roelofse is the owner and operator of Art Foamies. Art Foamies are durable, bold foam stamps designed for stamping images using acrylic paints, ink or glazes. They can be applied on many surfaces including pre-washed fabrics, card stock, walls, glazed pottery, cork, and wood. Each stamp comes with a reusable stamp pad that holds the paint and allows for even distribution to ensure a clean, crisp print. Owning a business was not new to Roelofse. A ‘lifelong entrepreneur” she has owned restaurants, a party supply store, and a bead store before moving to Canada. In Creston, she owned and operated Kootenay Candles and Creston Framing and Art Gallery before this latest endeavor. The stamp business started in May 2014. Less than a year later Roelofse was exhibiting her own product at the Association for Creative Industries CHA Show in California (since renamed Creativation). “It was my dream to have my own product at the show”, she beamed. “I first came to the USA (from Africa) at 18 years old with my mom, artist Jenny Steenkamp, to attend the CHA show as a buyer.” The next year Art Foamies finished in the Top 3 hot new products at the show as judged by a panel of North American arts and craft industry leaders. There are now wholesale locations in four markets (Netherlands, Australia, USA, and England) and over 40 retail locations including Arlington, Texas; New York, New York; St. Petersburgh, Florida, Sydney, Australia; Zwolle, Netherlands; Calgary, Alberta; and St John’s, Newfoundland to name a few. Locally, Art Foamies are available at Creston Card and Stationery. “Mike was the first store owner to support me. He is always willing to help” Roelofse says thankfully. Like any small business the ability to adapt, change and innovate is key to long-term survival. Differentiate or die, like the book by the same name espouses. To keep ahead of the competition Art Foamies has launched a subscription box service. The subscription promises to “take you on a wonderful journey where we will explore a variety of ways to use your ArtFoamies, with different mediums and techniques.” Available in 1 month, 3 month, 6 month and 1-year subscriptions they are packed with value and include exclusive new design foamies, a piece of fabric to stamp (for example a scarf), paint, a paint pattern, and step by step instructions and video on how to use it all. It is a busy job. Dealing with stores, designers, constant website updates, shipping, receiving and packaging keep the business hopping. Not to mention actually designing and producing the stamps. The biggest challenge, besides not being having time to do her own painting, is keeping up with production. There are two machines currently operating and they are adding a third, bigger, faster, greener machine with improved technology. To keep up with demand Roelofse and her partner Ian Richardson rely on their two dedicated staff members, Kristina McCormick and Ada L. Oler.